Chairman Tanoue has focused attention on emerging risks in the financial institution industry, and especially on the risks that arise from subprime lending. Further, under Chairman Tanoues direction, investigating fraud at banks is among the highest priorities for FDIC examiners because recent changes in the business of banking and innovations in computer technology create greater opportunity for financial irregularities. The FDIC has also recently refined its system of setting deposit insurance premiums to capture more accurately the risks that institutions pose to its insurance funds. 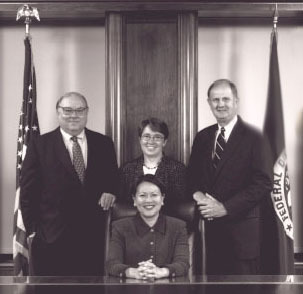 FDIC Board of Directors Donna Tanoue (seated), John D.
Under the leadership of Chairman Tanoue, the FDIC took an aggressive approach tosupervising federally insured financial institutions to ensure their readiness for the Year 2000 date change. In 1999, the Corporation engaged in an extensive program of Y2K public education and outreach in which FDIC officials participated in hundreds of outreach meetings and other Y2K events throughout the country. Ms. Tanoue personally appeared on network television news programs to describe the industrys preparedness for Year 2000, assuring the public that there would be no significant disruptions in the banking system because of Y2K, and in late 1999 she held press conferences in major cities throughout the country to raise public awareness of banking readiness. Before she became FDIC Chairman, Ms. Tanoue was a partner in the Hawaii law firm of Goodsill Anderson Quinn & Stifel, which she joined in 1987. She specialized in banking, real estate finance, and governmental affairs. From 1983 to 1987, Ms. Tanoue was Commissioner of Financial Institutions for the State of Hawaii. In that post, she was the primary state regulator for state-chartered banks, savings and loan associations, trust companies, industrial loan companies, credit unions, and escrow depository companies. Ms. Tanoue also served as Special Deputy Attorney General to the Department of Commerce and Consumer Affairs for the State of Hawaii from 1981 to 1983. Ms. Tanoue received a J.D. from the Georgetown University Law Center in 1981 and a B.A. from the University of Hawaii in 1977. Also involved in local government, Mr. Hove was Mayor of Minden from 1974 until 1982 and was Mindens Treasurer from 1962 until 1974. From 1987 to 1993, Ms. Seidman served in various positions at Fannie Mae, ending her career there as Senior Vice President for Regulation, Research and Economics. Other prior positions include Special Assistant to the Treasury Undersecretary for Finance from 1986 to 1987, and Deputy Assistant General Counsel at the Department of Transportation from 1979 to 1981. Ms. Seidman also practiced law for three years beginning in 1975 with Caplin & Drysdale, a Washington, DC, law firm specializing in tax, securities and bankruptcy issues. Mr. Hawke was sworn in as the 28th Comptroller of the Currency on December 8, 1998. After serving ten months under a recess appointment, he was sworn in for a full five-year term on October 13, 1999. As Comptroller, Mr. Hawke serves as an FDIC Board member. He also serves as a Director of the Federal Financial Institutions Examination Council, and the Neighborhood Reinvestment Corporation. Prior to his appointment as Comptroller, Mr. Hawke served for three and a half years as Under Secretary of the Treasury for Domestic Finance. He oversaw the development of policy and legislation in the financial institutions, debt management and capital markets areas, and served as Chairman of the Advanced Counterfeit Deterrence Steering Committee and as a member of the board of the Securities Investor Protection Corporation. Before Treasury, Mr. Hawke was a senior partner at the Washington, DC, law firm of Arnold & Porter, which he first joined as an associate in 1962. While there, he headed the financial institutions practice, and from 1987 to 1995, served as the firms Chairman. In 1975, he left the firm to serve as General Counsel to the Board of Governors of the Federal Reserve System, returning in 1978. From 1970 to 1987, Mr. Hawke taught courses on federal regulation of banking at Georgetown University Law Center. He has also taught courses on bank acquisitions and financial regulation, and serves as the Chairman of the Board of Advisors of the Morin Center for Banking Law Studies in Boston. Mr. Hawke has written extensively on matters relating to the regulation of financial institutions, and is the author of "Commentaries on Banking Regulation," published in 1985. He was a founding member of the Shadow Financial Regulatory Committee, and served on the committee until joining Treasury in 1995.